You are here: Home > T-Mobile sponsoring Stephen Colbert’s show: Best marketing ever? T-Mobile sponsoring Stephen Colbert’s show: Best marketing ever? When companies sponsor Stephen Colbert’s ‘The Colbert Report’, they don’t usually get what you’d traditionally class as an advertisement. In fact, his motto seems to be ‘as long as the company name is mentioned, I can do what I like.’ In an episode aired this week, he took the same approach to T-Mobile. 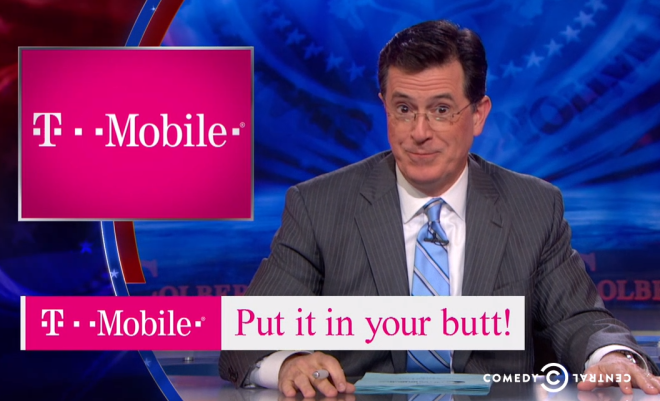 Unlike most ads, promoting the company’s Un-carrier plans and super-fast LTE, Colbert focussed more in a T-Mobile phone’s laxative properties. I shan’t say more. Just watch the video above and have a good laugh… Or cry, if you’re a T-Mo exec. Just watch the video…. and just how, pre tell, shall I do that when there’s no link? It should be below the post. Is it not appearing for you? Its very likely region locked. My fiance on work assignment in EU cant watch Hulu or many online videos. It’s not a link, it’s embedded. Glad you can see it. Since I’m in the UK, I can see the box where the video is, but it’s just a black screen for me. Must be region-locked. Yeah, works just fine in the States. I guess I’m the only on in the US that clicks it, is led to another page, clicks that & sees a larger image. :- God hates me! You can install Firefox addon (both on pc and cell) to unlock the region lock. Omg! I laughed so hard. He is silly. Very funny. I’m sure John loves it! Think that will piss off the racists that called him racist, and watch them flee T-Mobile? And, T-Mo carried the Samsung Vibrant. Coincidence? Wow, I feel old. Four minutes later and I’m still waiting to laugh just once. I’m starting to worry that Legere is getting too enamored with being “cool”. They’re spending a lot of time and money on music, DJ’s, comedy, etc. aimed at the 20-something crowd. The T-mobile brand already has connotations of “budget conscious”- if it starts to become the Miley/Bieber phone company a lot of us will be uncomfortable. I like TMO but it’s not worth it to save a few bucks to drive a hot pink Fiat. I’m a black Mercedes kinda guy. I agree. I sometimes find some small humor in Letterman, but not in Leno and definitely not in in Colbert. Fallon on the other hand, cracks me up. If he had done this bit, it would have been viral already. jimmy fallon is an annoying tool. You probably should not watch it then. Just a clarification from an employee…. we don’t assist with installation in this case… sorry guys! Daily Show does it with Arby’s…and it puts the name in my head. That’s marketing. Since the show is semi-fake then you take his character’s remarks and stance with a grain of salt. Remember, he’s playing a character. The troll you are referring to, is it the actor or the character that he is playing on the show that you want to see fail? The character won’t be hosting Late Night. T-mobile lost some major points to me because of this. Let’s just say that Colbert can go take a dive in a lake of horse squeeze. I don’t think they lost any points. They ran a creative add on one of the most popular TV shows for that time slot. You personally don’t like Stephen Colbert and that’s ok but you are definitely in the minority with that one!! What you really need to do is just GOY (get over yourself.) If you can’t see the humor there’s something wrong with you. No there’s nothing wrong with me you JA. People have different tastes, likes, and opinions. If you think we should ALL like this or respond in the same way, them you may want to step into the real world. On the cocntrary there seems to be something wrong with you that you can’t be part of a forum without calling people names and acting like a total jerk. Learn how to act in public and perhaps you won’t be censored. I attacked you because you act like a jerk. But you initiated it. As stated earlier, Cellphonetech responded to my original post with some tact and I respected him for it. You however came off as a (male body part ) so I responded in kind. If you don’t want me to be a jerk, don’t act like one. And it ends here. Thank you. This is a genius advert for T-Mobile. There is no such thing as bad publicity. No matter what Stephen Colbert says, it was a T-Mobile add on one of the most popular shows during that time slot as Cellphonetech said. This was genius.